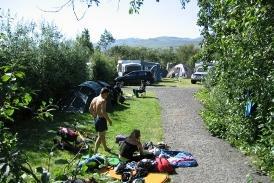 Perfect family camping area with a variety of recreation possibilities. A new camping ground was taken into operation in Varmahlid in the summer of 2008. It is located in the protected forest area on the southern slope of Reykjarhól and is open from 22nd of May to 16th of September, opens sooner and closes later if weather permits. Hiking trails: Easy walks are around the forest and neighbourhood, or for the more experienced you can hike up Mælifellshnjúkur, Tindastóll or Glodafeykir. Museums, churches and places of historical interest and importance are located nearby, and for the more adventurous horse riding, horse shows, river rafting and paintball operators are within a walking distance to name but a few of the attractions in the area. In Varmahlid 500 meters down the hill you’ll find all the practicals, including the Tourist information centre, restaurant, supermarket, post office, gas station and bank.The camp sites in Sauðárkrókur, Hofsós and Varmahlíð are working together. You can therefore stay the first night in any of the three camp sites and the next night in one of the other campsites at a discount rate.